How an upstart coalition fighting for net neutrality beat Comcast and Verizon - and the web was won (at least temporarily). A year ago, if someone said an upstart coalition fighting for net neutrality would beat Comcast and Verizon, most would have laughed or just rolled their eyes. On January 14, 2014, we’d just lost a major lawsuit and were up against the most powerful lobby on Capitol Hill. Obama was at the Comcast CEO’s house so often that he joked, “the only thing I haven’t done in this house is have Seder.” They had millions of dollars, hundreds of lobbyists, and a literal seat at the table. We had a lot of groups with passion, creativity, expertise and resolve…but not the special-interest firepower of Washington. What looked like a disparate coalition became a well-oiled machine that was connected across the country, smart on policy, and loud in the media and across the Internet, mobilizing millions. Like most overnight success stories, this one was a decade in the making. This coalition of dozens of nonprofits had online organizers, next generation civil rights activists, policy wonks, communications and strategy experts and forward-thinking funders. It was a beautiful piece of progressive machinery that on February 26, 2015 smacked down the telecom lobby with a victory for freedom of expression, levelling the playing field for all Americans. How did we do it? Here are ten elements of the campaign that led to our victory against all odds. At every point in the campaign, our targets at the FCC, White House and Congress told us we were either unrealistic, too aggressive, ill-directed, or poorly timed. But it turns out that what we were doing, at every stage, was exactly right. And just when we were nearly collapsing in frustration, they cracked, not us. Remember the positioning of your naysayers. The opposition wanted to make it an issue of over-regulation and free markets. But we knew that net neutrality, once framed right, resonated with ordinary Americans as an issue of free speech, opportunity, diversity and innovation. Research showed that despite the conservative media narrative throughout the year, this was still how people thought about the open Internet. If you frame your issue right, you can even overcome the barrier of an awful term like net neutrality! Telecom company fat cats accused us of 1930’s style government regulation but our side cultivated dozens of the most innovative companies of the 21st century. Support from Netflix, Etsy, Tumblr, Kickstarter, and Twitter cemented the idea that a free and fair internet was the way of the future. Sometimes the people standing with you says more than any press release can. Us: Play? Who has time to play? Grassroots groups that advocate for communities of color, low-income Internet users, faith organizations and more put to bed the notion that this was an elite issue and showed how it is a modern civil rights issue. Drawing comparisons from MLK’s censorship by NBC in the 1960s to Ferguson’s rise to national attention through Twitter, we staved off the incumbent’s longstanding dominance of telecom policy. Anyone reading DC papers, magazines and political blogs would have thought we were never going to win, right up to the very last days. Even the early pre-mortems were breathless about how this could have ever happened. Most looked for easy inside-the-beltway explanations and overplayed the opposition as inevitable winners. Media coverage can be a good indicator of how a battle is going, but in most fights against institutional power, it is deeply skewed. To help gain perspective, we used data. During one Congressional hearing, we monitored the four separate Twitter conversations to determine that our message dominated three of them and that the fourth, which we lost, had only 15 percent of the reach of the other conversations. A helpful number to show decision makers who are worried you might be losing the narrative during a fight. We had a deep bench of policy experts who could decode complex language and see the small words that would create large loopholes. This allowed us to push from the outside and inside up to the final hours of the negotiations to make a powerful policy. 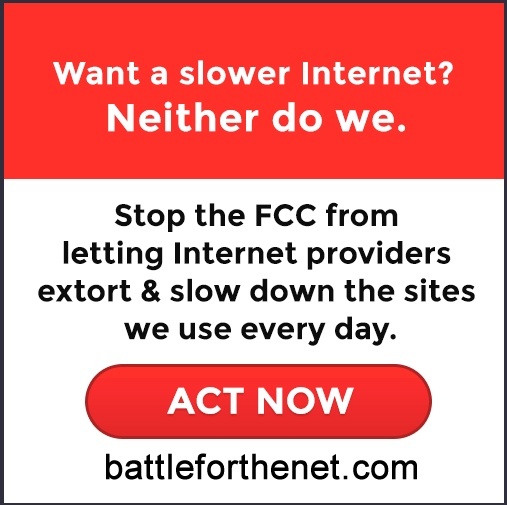 A call to action from BattleForTheNet.com. Admittedly, we got a few gifts. When John Oliver did his 13 minute video, it expanded our audience. But luck favors the well prepared. You can’t make a celebrity pay attention to your issue, but you can give them something to pay attention to. And you can make sure you’re ready to capitalize on the extra attention as soon as it comes your way. Some of the most important things we did were the least interesting. We stuck together as a big, unwieldy coalition, holding countless meetings and strategy retreats. We communicated a lot. Sub-committees were formed to handle different aspects of the campaign. We kept trains running and kept the peace. Issues like gay marriage went through dark times in 2004 before creating a stunning reversal by 2012. Losing the net neutrality battles in 2010 gave people critical lessons and experience that in hindsight helped pave the way for the victory of 2015. During the 408 days since the Verizon decision, the coalition helped create 8-10 major media cycles for the issue. 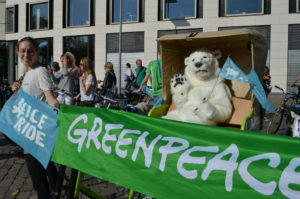 Our targets were always expecting public interest to wane, but we came back again and again, month after month with creative new campaigns to keep the issue front and center until it could no longer be ignored. It shouldn’t be a surprise that in the end, it was the blood, sweat and tears of people that powered our victory. Telecommunications policy is an increasingly central part of our democracy. This win puts Congress on notice that the fight to preserve democracy, freedom of expression, equity and social justice is here to stay. Act one was SOPA. Act two was net neutrality. Act three is our future. 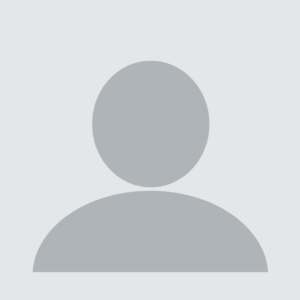 Michael Khoo is Senior Vice President at Spitfire and coordinator for the net neutrality campaign coalition. 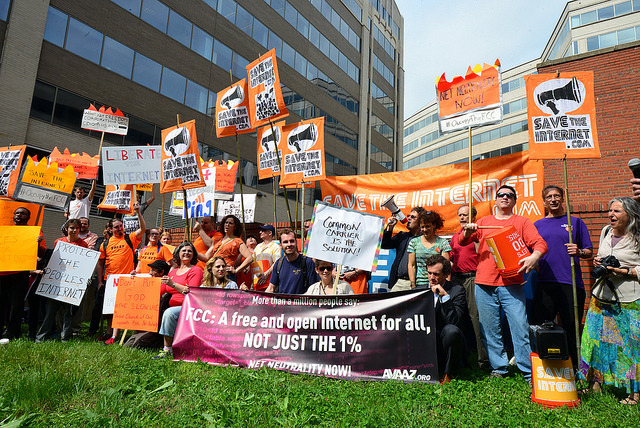 Top photo: Citizens protest in support of Net Neutrality in 2014. Courtesy Free Press.